I run my JPW AP3 speakers with Marantz CD60 and Topping TP60 AMP. I am curious about adding a PASSIVE PRE-AMP, could you guide me if this would add/cut anything to the sound? Thanks for your question. I don't think you'd be likely to get any benefit from a passive pre-amp as you would just be adding an unnecessary component into the signal chain. That would be more likely to damage the sound than improve it. You wouldn't be able to bypass/replace the preamp functionality in the Topping amplifier so I can't see that you'd gain anything. I guess if you had more sources to switch between than inputs on the Topping then there might be a need. It's also just conceivable that another pre-amp could work better with the CD player from an impedance matching perspective – though there's no reason to think that would be the case. So, on balance I think you're better off spending the money on more music! Off the top of your head, do you know whether the output of the CD channel on the Concordant Excelsior is ≈2mV or less? I ask because it will have a bearing on my choice of power amp to avoid clipping when playing a fully modulated CD. It's good to hear from you again and that your Concordant Excelsior is still delivering the sonic goods. The Excelsior was Dougie's strangest circuit, and in my humble opinion the best. For example, and highly relevant to your question, it features the volume potentiometer (variable resistor voltage divider) after the gain stages. Indeed, the volume pot wiper is the final part of the circuit before the output sockets. It is more usual to have the volume potentiometer at the front of the line stage. This common practice ensures that the line stage does not get overloaded by excesive input voltage. The more common arrangement also ensures that the interconnect cable is driven by a low source impedance, reducing noise and ensuring noise and output impedance remain fairly constant regardless of volume control setting. The eccentric arrangement of the Concordant Excelsior positioning one ECC83 before the volume pot creates a high and variable output impedance (exceeding 8kOhm at certain volume settings). In this respect the Excelsior resembles a passive control unit with the potential for problems with long or reactive cables. However, it the choice of high gain line stage valve, the ECC83 also makes a 5volt output capability possible. Indeed, the output can vary between 0V to in excess of 30V (if more than 1% total harmonic distortion can be tolerated at 30V). Hence the answer to your question is a postmodern "both/and"! The ECC83 resistor loaded grid input should tolerate the 2V output of a Red Book CD player, which is 5.6V peak-to-peak, and some CD player designers were said to cheat the A-B shop demonstrations by making their outputs 2.2Vrms, which is over6V peak-to-peak. This compares with line level outputs of 0.775 Vrms (≈2.2V peak-to-peak) for contemporary tuners and tape decks. Hence, the output of the Excelsior should have no effect on the choice of input of the power amplifier in terms of voltage sensitivity or overload characteristic. However, and you knew there would be a 'however', the bizarre output impedance characteristic of the Concordant Excelsior might influence power amplifier choice. A power amplifier with a benign input characteristic of at least 400kohm would be advised for minimum noise and influence of cable characteristic impedance. A reasonably sensitive power amplifier can be modified to 1Mohm without any problems, which I have done when using long cable runs. Choosing a cable with an impedance dominated by linear resistance, rather than exotic capacitive or inductive cables, will reduce the impact on frequency response and phase shift of the Excelsior's variable output impedance. Do let me know what you decide works well with the Concordant Excelsior. In my experience it's joie de vivre worked surprisingly well into Naim power amps (which typically have 19dB gain), despite the Naim system building philosophy implying the opposite. Similar results might be have from Exposure or Creek power amplifiers, although I have no personal experience of those combinations. Do check for DC offset before you hook up any old pre-amplifier to a power amplifier and avoid direct coupled power amplifiers. Hi Nick and thanks for your in-depth explanations and opinions! As far as monoblocks vs integrateds I'm not a monoblock purist. It must sound great. That's all :-) I don't own a Bantam Gold but the monoblocks have been on my short list for a while. I asked you about them because, if I understand correctly, they're not class t/d amp but chip amps. They use the Analog Device chip ad1592. Did I get it right? If you feel like replying about this it would help me getting a better idea. P.S. BTW, Clones has the new amp you mentioned in the article out. It's a 55 watter. the Bantam Gold should be seen as being more like a class T/D (chip) amp than a class AB (chip) amp. Thanks for the heads-up about the new Clones Audio 55pm amps. When considering the power output of this type of amplifier it is important to understand how much the increased power rating is down to the PSU section, and which chip has been used. For instance, IMHO, the LM3875 sounds clearly better than the LM3886 that can be used if you need more power. Some says the less powerful LM1875 sounds better again. Of course, much depends on the efficiency of the speaker used. In some case the LM3875 may not be able to provide sufficient power. I'm contacting you for some suggestions and further details. Some questions could sound trivial, basic...sorry for that but I'm not so keen on electronics. In the article you cited your modification at the input section. "Replaced the tiny stock capacitors with some 2.2 uF polypropylenes"...could you please show me where they are? Probably I've seen only one not more...sorry for that. Rehousing the amp in a new aluminum case (of 1U rack high) I would also modify the power unit. What do you think about of using a toroidal transformer? I didn't find anyone of 13.8 V but just 12V, could it be even a good choice? And what about the stabilizing circuit? The actual unit (an Italian made by ZETAgi mod 143) is stabilized but what does happen just substituing the transformer? Does the result would work? Could be the new transformer and old stabilizing circuit compatible? Which are the fundamental parameters to check before buying something? It's so long ago since I looked at the inside of an SI T-AMP that I can't remember what it looked like. But to locate the input capacitors you could use a multimeter to find a connection between the signal input (back of the input socket) and what should look like a small white block, that would be an input capacitor. One of the connections of that white block should be connected to the input socket. As regards a better (linear) power supply, please be very careful if you do not know what you are doing. For a 12 volt DC power supply you should use a 9 VAC transformer, or you could use a 12 VAC transformer and regulate the voltage down to 12 volts DC using something like an LM317 regulator. It is not as simple as simple replacing a transformer though. For a comprehensive guide to power supplies have a look at this guide on DD. It is written for people building chip amps but applies to any linear power supply. If you build a working 12 volt supply it will work with the SI. Finally, I would caution you against spending too much more on the SI. Class-T amps have come a long way since then, and something like a Temple Audio Bantam may be a better investment. Hi Nick i've just read your review of the Clones Audio 25i amplifier on TNT. The amp sounds quite interesting. I was wondering how would you compare it to the Temple Audio Bantam Gold which you reviewed in February 2011 and even more to the point to the Bantam monoblocks if you've had the chance of auditioning them. I have reviewed the Bantam Gold, and would rate it as the best of the 'digital' amplifiers that I have heard. The Clones Audio amp would rate as one of the best of what we call chip amps. Perhaps more accurately we should call them class AB chip amps. I stated in my review that I prefer the sound of the (class AB chip amps) over the the class T/D chip amps, and given the choice, I would plump for the Clones Audio 25i over the Bantam Gold. But, we are talking about one amplifier that costs around 520 UK pounds, and another that costs only 179 UK pounds so I'm not sure that this is a meaningful comparison anyway. If it is a question of you choosing which type of amplifier to purchase, my advice would be to go to somewhere like the diyAudio forums where a large number of the contributors will have heard both types of amplifier, and can give you their opinions. If you are asking because you already own a Bantam Gold, and want to know if the Clones Audio 25i would be a significant upgrade, I would say yes. Apart from it sounding better, the cost of the 25i pays for a more expensive case and finish. But of course, it should have these at the price. Moving on to your question about monoblocks, I haven't heard the Bantam Gold monoblocks but have used two of the stereo Golds as monoblocks. I used to be of the strong opinion that monoblocks would always out-perform a stereo amplifier. These days I am not quite sure. I have monoblock chip amps (class AB) and stereo amps using the same chips and specifications (including power supply rating), and find it difficult to hear a significant difference. As ever much will depend on the speakers. But are you asking me if it would be better for you to buy a second Bantam Gold, or go with a 25i? If so, I would still say I think the 25i would sound more enjoyable. The Clones Audio 25i isn't the only option for a class AB chip amplifier. You can still by kits from the likes of Audiosector, and build them into your own choice of housing. Depending on your choice of finish, that could possibly work out closer to the price of the Bantam Gold. If you decide on that option, please do a complete costing of all the components before you start as it is surprising how it all adds up! There are also other commercial options for what we call 'Gainclones', such as the recently released Model A from Audial. Nice write up, I owned many of his amps, my fav were the 2 Nines with a lot of mods, sweetened them up and drove a deeper bass, wish I still had them, but with Vandersteen 5's needs a bit more power, Classe cam 200s. I work with live sound and have installed a number of house PA's with 3 mains FOH, using some of his ideas with great results. He was ahead of his time, but was in ours. thanks for the feedback on James Bongiorno and his wonderful products. You are right, he was definitely ahead of his time, the whole audio community still misses him a lot. loved your comparison of budget cartridges! Very informative and clear & simple! Can you do another comparison including a low-end Denon and Audio-Technica soon? I'm glad you found the article helpful. I am actually working on the Audio Technica 150MLX next, so stay tuned. I also did approach Denon to participate in this review, but they seem to not have their wits together with producing and distributing their cartridges. Zu Audio has also voiced such a complaint, since they offer aftermarket version and have had trouble getting supply of stock cartridges. here are pics of my new listening position. The rack width is shortened to 46 inches. I need to try with the speakers pushed as close to the wall as possible (say about 1 feet from the rear wall - which is their normal resting position) and try and pull my seating position closer to the speakers and see what happens. Maybe a floor stander will serve me better :-)) or a smaller speaker that might need the rear wall as re-inforcement (something like the Linn Majik 109 or Amphion Ion+) and that would suit me as well since I won't have to pull and push the speakers to get to the optimum position. this speaker positioning seems reasonable now, at least walls and furniture aren't close to the speakers, but I understand it is hard to keep the speakers this way in a shared living room. For this reason you might want to explore different solutions, like speakers which are designed to stay close to the rear wall (Linn, Naim, Rega, Audio Note...) or even some omnidirectional design like the Duevel Planets or the Duevel Enterprise. 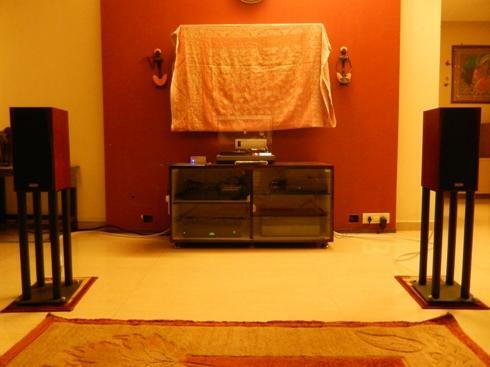 Moreover, do not forget panel loudspeakers like Magneplanars. They could be a very nice and good sounding solution.